Robert Johnson wrote the blues song Love in Vain long before The Rolling Stones made it a hit. In the song, a man is taking his failed romantic partner to the train station. In the market, the only real winner today was the train – or the Transportation sector (IYT). 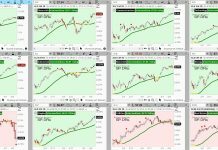 All the stock market indices turned red. 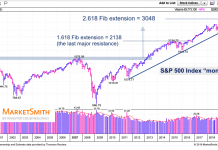 The Retail (XRT), Biotechnology (IBB), and Semiconductors (SMH) sectors also sold off to close red. Transportation IYT gained, even making a new swing high today at 194.32. Semiconductors SMH, also made a new swing high before selling off. There’s one more day left in the week, a week defined by chop and low volume. In the news, Nancy Pelosi said that she would meet with Trump to talk about an infrastructure bill (one we Americans have been hearing about since forever). While the idea has bi-partisan support, there is little agreement on funding or how to pay for it. That makes the prospects dim. Nevertheless, the weekly chart reflects some optimism. IYT is on a new swing high and leaving distance between price and the 50-week moving average (blue line). Until that changes, or IYT breaks below the 190 area, the bias remains friendly. Now though, “it’s hard to tell, hard to tell”, if all the market love was in vain. Russell 2000 (IWM) – Confirmed accumulation phase. 156.36 must hold. 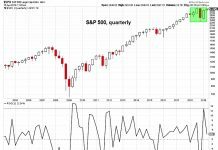 Nasdaq (QQQ) – Made a new Swing high at 185.78 before closing red. KRE (Regional Banks) – 53.40 pivotal resistance cleared making it pivotal support. SMH (Semiconductors) – New swing high at 113.03 and then sold off. Must hold 111. 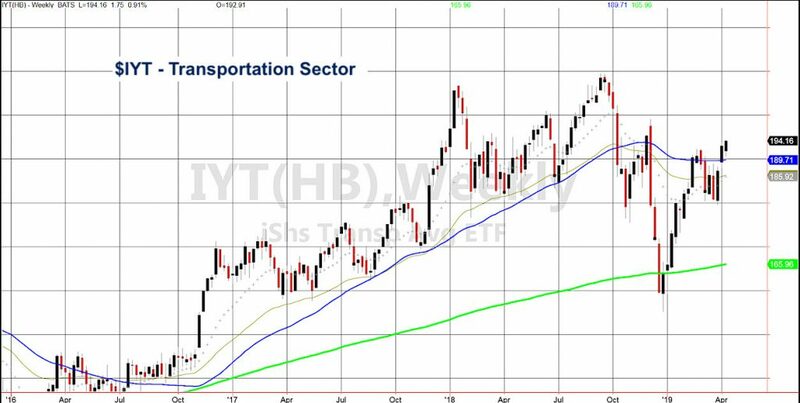 IYT (Transportation) – New swing high at 194.32. 191.75 immediate support to hold. IBB (Biotechnology) – 115 key pivotal resistance 110.90 key support.